Topaz 2 ... taking shape in Dubai Silicon Oasis. Topaz Residences Tower 2 (Topaz 2), which is taking shape in Dubai Silicon Oasis, stakes claim to hosting the most spacious one-bedroom apartments offered at the lowest price per sq ft in this prime area of the UAE emirate. The 200 apartments within the eight-storey building – each with an average area of 1,000 sq ft – have been carefully designed to offer efficient and flexible living spaces and optimise on natural sunlight through their large glass windows that provide panoramic views of the city, a spokesman for GGICO Properties, the real estate marketing and sales arm of GGICO Group, tells Gulf Construction. Topaz Residences comprises three high-rise residential buildings that feature stylish and spacious one-bedroom apartments, complete with all the modern-day amenities. All the three towers span a total built-up area of 697,924 sq ft, housing a total of 448 apartments. These residences are specially designed for a relaxed and peaceful life away from the hustle and bustle of the city. The project is 15 minutes from Dubai International Airport and five minutes from Dubai-Al Ain Road and Sheikh Mohammed Bin Zayed Road. “The residential properties at Topaz are part of a family-friendly community, close to international schools and with connectivity to the proposed metro. The rich ambience includes restaurants, healthcare centres, supermarkets and banking,” he adds. Work on Topaz 2 – the most premium of the series – was launched in 2015, and is more than 55 per cent, with blockwork and related finishing works, such as plastering and painting, and electromechanical works currently in progress. The project consultant is Incorporated Consultants (Conin) and the contractor is Reem Capital Contracting. According to the spokesman, the apartments have a generously sized living room that can transform into a second bedroom with bespoke modular furniture. In addition, there are a few units available with a store room that can be modified into a third bedroom or a den. “It is space that grows with your family’s expanding needs,” he says, adding the project is expected to be completed in September 2018 and will be ready for handover starting Q4 2018. The apartments, which are designed in an Italian style with high-end finishes, feature a fully-equipped modern kitchen and spacious balconies that extend the space for ideal indoor and outdoor living. The building is one of few in the area with two swimming pools in addition to a spacious health club equipped with high quality fitness equipment. A huge roof canopy enhances the aesthetics of the structure. Residents can also avail of a rooftop health club, swimming pool, gym and Jacuzzi with sauna and steam. Meanwhile, the outdoor spaces allow children to play and explore and the elderly to engage in activities like yoga, morning or evening walks and more. There is also ample parking space for visitors and guests. The developers of Topaz 2 have adopted a number of measures to reduce power consumption and use environment-friendly materials. These include the use of LED lights; special equipment that improves the performance of the air-conditioning system (such as recycling of cooled air), and use of ozone-friendly refrigerant gas. Special glass panels have been installed to enhance the thermal insulation of building spaces while the use of a LPG system means that the high power consumption of electric cookers is avoided. In addition, green landscaped areas cover 10 per cent of the plot area. Units at Topaz 2 are offered at an affordable price, starting from Dh691 ($188) per sq ft.
Handover of units within Topaz Residences Tower 1 began at the end of last year (2017). Work on Topaz Residences Tower 3 is 75 per cent complete with the handover scheduled in the third quarter of 2018. Topaz Residences is the newest addition to the premium residential offering by GGICO in Dubai Silicon Oasis, where it holds 34 per cent of the total residential projects - its other existing projects being Axis Residences and Platinum Residences. Dubai Silicon Oasis is a residential and commercial hub, focused on innovation, technology and convenience. 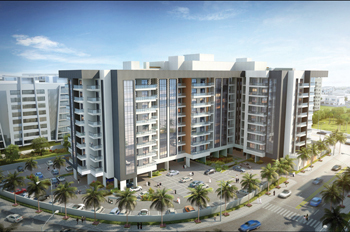 This ‘integrated’ city within a city offers a plethora of residential and lifestyle facilities. GGICO Properties, part of the GGICO Group, is a renowned Dubai-based real estate service company led by industry veterans with extensive local and international market experience. The company has delivered many iconic freehold developments in the UAE, such as Horizon Tower and Emirates Crown in Dubai Marina, Crown Residences in Tecom, Olympic Park and Grand Horizon in Dubai Sports City, besides Axis Residences, and Platinum Residences.